Throughout the last decade, the research area of wirelessly networked sensors has been one of the most popular among computer engineers and scientists. With recent initiatives such as Cyber-Physical Systems, Internet of Things, and Planetary Skin, sensor-based applications have gained new momentum in the research community and industry beyond the realm of computer engineers and scientists. Therefore, today wireless sensors are not only used by computer engineers and scientists, but also by ecologists for observing wildlife, geophysicists for monitoring seismic activities of volcanoes, farmers for precision agriculture, civil engineers for monitoring the health of deteriorating civil structures like highways and bridges, medical doctors and nurses for monitoring patients, and technology enthusiasts to develop applications. Currently this diverse group of engineers and scientists have two options: expend considerable expense on proprietary data acquisition systems, or expend considerable time on learning the development and engineering skills necessary to create their own solutions from more affordable off the shelf components. Neither of these solutions is truly optimal and thus hamper the development and data collection experience. 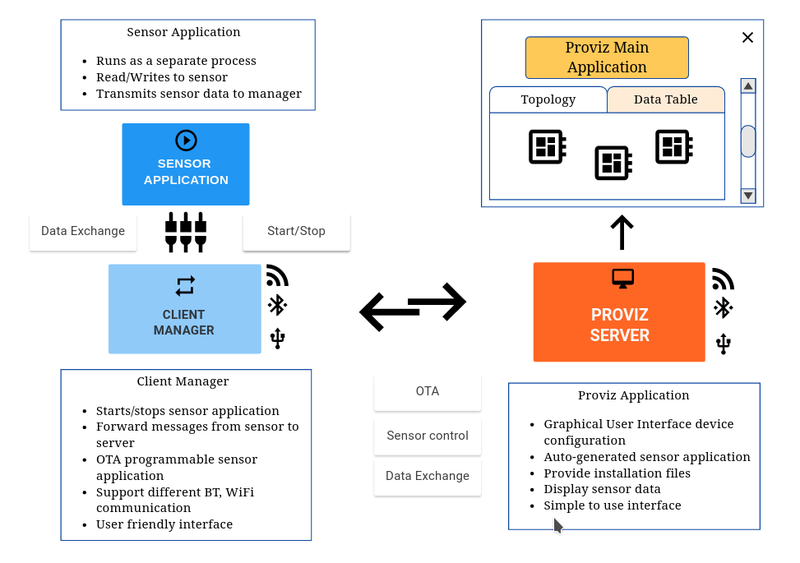 To minimize the complexity and reduce the cost of implementing these sensor networks, a new extensible, scalable, cross-platform, and open-source wireless sensor software development framework called PROVIZ is proposed in this project. There are many scenarios in which engineers and scientists may need to acquire data from a system or environment using a network of sensors. These sensors are tools and a means to the end of acquiring relevant data. A minimum of time and effort should be dedicated to configuring and maintaining them. Using and configuring these sensor networks should not require any special knowledge from the user, it should be a simple tool. Current options require either software development expertise or incur large costs for specialized proprietary systems. The proviz project attempts to remove the barriers of entry into the growing IoT world so engineers and scientist have the tools they need to continue to push innovation and science. The Proviz client application is designed to be easily installed and take care all all steps need to get a device up and running as quickly as possible. The client application will control the separate sensor application starting, stopping and replacing the as need. All communication between sensors and device will be relayed back to the Proviz server for the user. On the Arduino platform the client application takes the form of a C/C++ library. When the user auto-generates the sensor code the library is included and is used in the same regard, controlling the sensor application and relaying data.